You must have a Spend Matters Membership of any level and must be logged into your account to submit an Almanac listing. The Spend Matters Almanac is a procurement vendor directory of software firms, outsourcers, data providers, research firms, consultants, and similar organizations that serve the procurement and supply chain market. Make sure you are logged into your Spend Matters account. Fill out the form and submit your listing. We review your listing and send you a notification of approval or request a change. Please allow up to two business days. 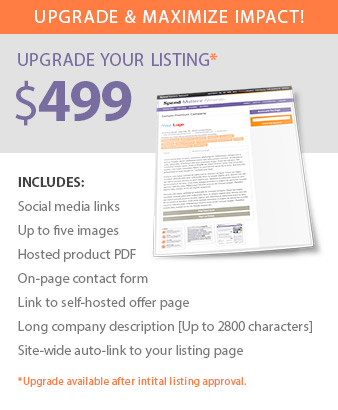 Visit your membership profile to edit your listing and add your logo and short description. After the initial approval, a premium upgrade is available for $499. We review and approve any listing edits. When you need to update, just log into your account. Please select a block below to view the Almanac for that category.